On the edge of the subterranean Caicos Islands plateau, where the depth drops from 50 feet into the thousands. Freediving can be a really tranquil experience. You’ll definitely want to get proper instruction before diving. Freediving can be dangerous and should not be attempted without proper instruction and experience. This article is for general educational purposes only and is not an endorsement or recommendation for this activity. Freediving can be a relaxing and spectacular way to discover the pristine marine environment of the Turks and Caicos. It’s difficult to find a setting as beautiful as the ocean surrounding these islands. This sport differs from conventional snorkelling in that freediving is a more strenuous activity that emphasizes descending to greater depths. With a bit of practice and training, it’s quite easy to reach depths of 35-45 feet (11-14 meters), and diving past 60 feet (19 meters) is often within reach for those who pursue freediving. 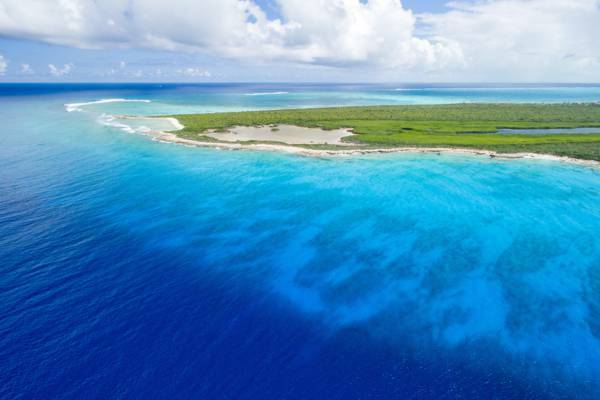 The depths of the Caicos barrier reef are generally consistent around Providenciales. The top of the wall is typically 40-60 feet (12-18 meters), and off the wall it rapidly descends into the thousands. 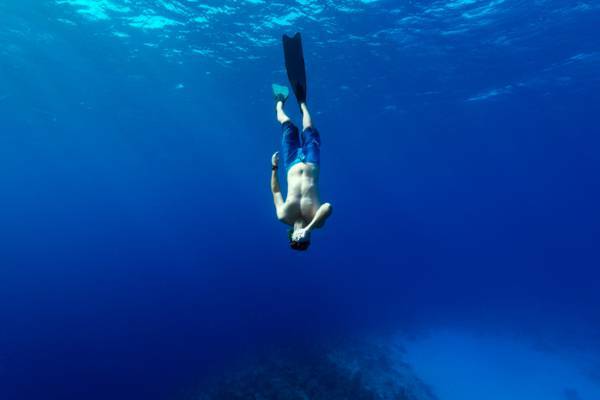 Freediving is becoming more popular as low-impact environmental tourism gains in popularity. 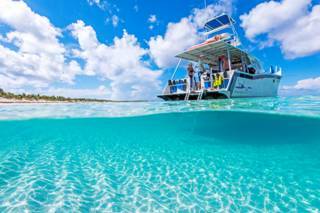 Both instruction and excursions are offered on Providenciales. Local water sports operators typically visit the barrier reef off Grace Bay Beach due to the ease of accessibility. For safety reasons, never freedive alone. Many outdoor sports have inherent safety considerations, and freediving is certainly not an exception. This article refers to recreational freediving, and not competitive or deep water freediving. Due to these reasons, we highly advise that participants receive proper and certified instruction, and have a safety boat and rescue diver present. Get appropriate freedive training before attempting this sport. Never dive solo. Always have a diver present trained in rescue. When freediving from shore, always be aware of wind and currents. Many of the coasts in the Turks and Caicos that are near the abrupt barrier reef wall and deep water typically experience off-shore wind. Only dive under good conditions. If any weather or physical difficulties occur, cancel the session. Know your limitations and don’t exceed them. Even more so than is the case with snorkelling gear, when purchasing it’s important to have a selection to choose from so as to ensure proper fit. 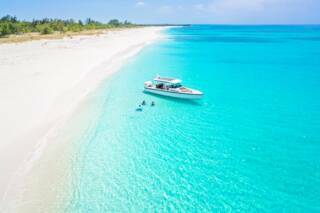 Dive Provo in Grace Bay has the finest selection of equipment of the Providenciales water sports shops. Freediving off Malcolm's Road Beach. A proper freediving mask will make your underwater experience much better. The main difference between a SCUBA or snorkelling mask and a freediving mask is the volume of air that the mask contains between the glass and your face. A larger volume mask, such as is common with the usual snorkelling setup, is more difficult to equalize than a low-volume mask. A freediving mask can work well for snorkelling and diving as well. Long fins, typically a bit more rigid than standard fins, are the common choice. These are often the same style as spearfishing fins. As is the case with the mask, freediving fins are often suitable for SCUBA diving and snorkelling, but not the other way around. Monofin “mermaid” style fins are gaining popularity with serious freedivers, but it’s much easier to begin with the conventional bi-fins. 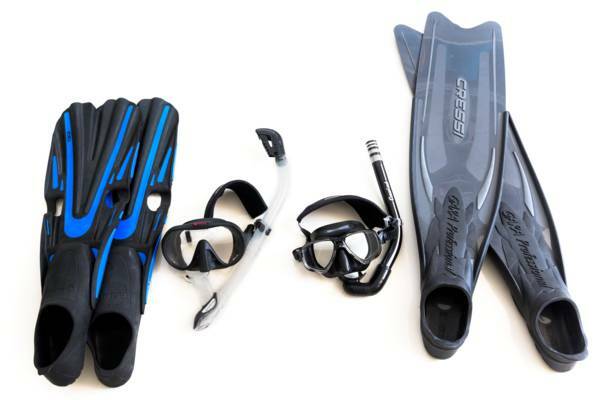 Standard snorkelling equipment compared to free diving gear. The use of a snorkel is up to the personal preference of the diver. Some prefer the simplicity of no snorkel, others appreciate having one. You’ll want to select a snorkel that’s streamlined when moving through the water. A snorkel is largely used for convenience when floating at the surface, and not when diving. A simple and classic aerodynamic “J” tube is best. Avoid a snorkel with a purge valve or a dry/wave valve. As stated above, get proper training. Blast-clearing the snorkel, a common practice when snorkelling in shallow water, can cause a black-out if the diver is close to his limit. Although not quite as important as the mask or fins, a depth gage will give a definite answer to the perpetual question of “How deep did I get?”. There’s a bit of overlap in the abilities of devices capable of giving depth readings. Many dive computers have a freediving mode, as do some sport and dive watches. If your practice other outdoor activities, you may find a device that’s suitable for multiple sports. 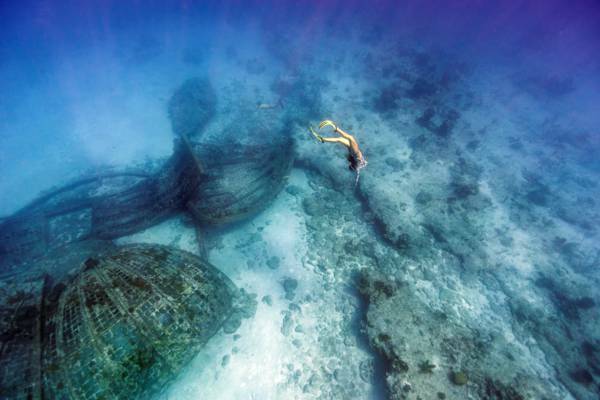 Freediving at the collapsed Thunderdome. Malcolm’s Road Beach is the only beach on Providenciales close to the barrier reef and deep water off of the Caicos Islands. Unfortunately, the wind at this spot is typically offshore and the wall is about 1700 feet (520 meters) from the coast, so it makes sense to visit this area with a boat for safety reasons. Visibility, however, is usually quite good and sea life abounds. A truly unforgettable experience is freediving with whales. During the winter season, humpback whales migrate past the Turks and Caicos to banks in the region to give birth and mate. Most encounters occur at relatively shallow depths. Spearfishing, and the possession of spear guns or Hawaiian slings is illegal in the Turks and Caicos. The barrier reef and wall at Northwest Point, Providenciales. The barrier reef is within swimming distance of shore at many locations, however, doing so isn't advisable due to offshore wind and possible weather changes.